John McAslan + Partners is developing new designs for the huge Baitul Futuh Mosque complex in south London, which was damaged by a fire last year. 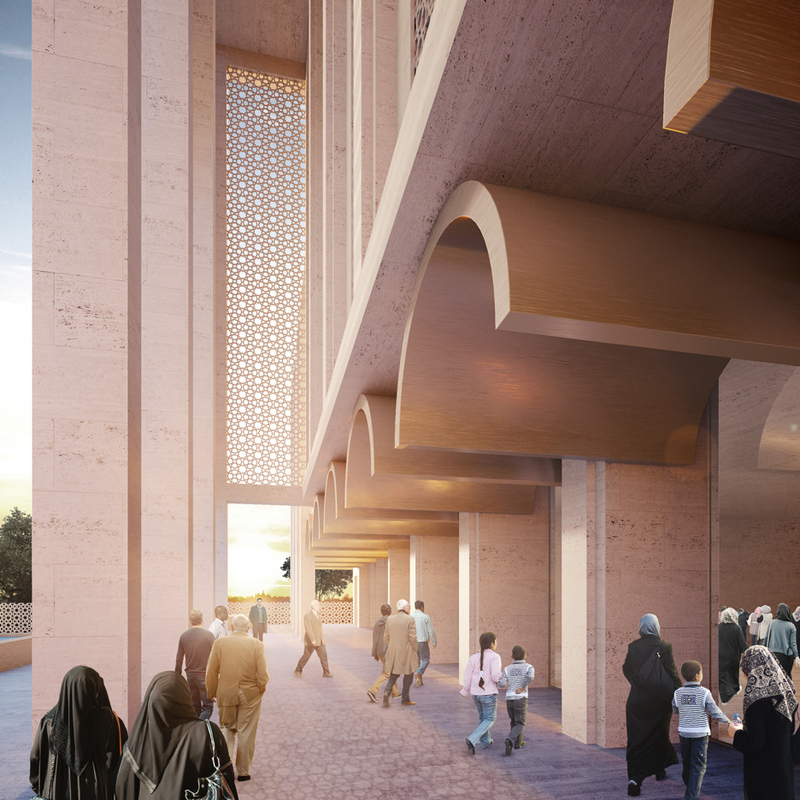 The London studio, led by Scottish architect John McAslan, will completely overhaul the 21,000 square-metre mosque complex in Morden – one of the biggest mosques in Europe. The firm will redesign key areas that were irreparably damaged by the fire, including function halls, offices, and apartments. It will also add a new wing, creating separate entrances for pedestrians and vehicles to improve security. A new street-facing facade, an expanded courtyard space and more accommodation will also be included. "Reinstating the fire-damaged elements of the building is a priority, but the practice is also exploring long-term opportunities in order to establish an overall development framework that responds to the client's wider aspirations," said John McAslan + Partners. The mosque complex serves the local Ahmadiyya Muslim community. It was originally built in 2003, with its estimated £15 million cost covered by donations from Muslims in the UK. As well as the main prayer areas, the complex encompasses a library, exhibition spaces, a TV studio, gym, guest accommodation, offices and multi-purpose rooms. The 2015 fire started in the complex's administrative area and covered 50 per cent of the ground floor as well as some areas of the first floor, although prayer areas were undamaged. John McAslan's new designs for the complex are due to be submitted to the local council for approval at the end of summer, when further details of the design will be revealed. Based in London, the firm also has studios in Edinburgh and Doha. Its best-known projects include the new concourse at London's Kings Cross station, which opened in 2012. It also oversaw the restoration of the Iron Market in Port-au-Prince, Haiti, after the 2010 earthquake and the design of the Jumaa Mosque in Doha. Other recent examples of contemporary mosque architecture include Emre Arolat Architects' Sancaklar Mosque near Istanbul, which features terraced landscaping and a "cave-like" prayer hall. A number of European architects are currently developing mosque proposals, including BIG's Islamic culture complex in Tirana, Albania, Amanda Levete's competition-winning design for a mosque that will form part of the Foster + Partners-designed World Trade Center Abu Dhabi development, and Henning Larsson's Islamic community centre in Copenhagen. See more contemporary mosque designs in our Eid roundup.